It happened again. I had another set of conversations with people who have fallen into the trap of “attacking the debt” without first beginning to save money. Here’s the deal. Credit card companies KNOW that life is always going to have financial emergencies. ALWAYS. If they can convince you to use them for “emergencies”, they know that individuals are much less likely to maintain a savings account for emergencies. As a result, when there is an emergency, the credit card is the hero and the individual sinks further into debt. Just stop it. Before paying a dime more than the minimum payment, build up your emergency savings account. Save at least $1,000 – make it $2,500 if you have kids and/or own a home. Yes, it slows down the debt pay-off. Yes, it is frustrating to focus on savings when one has debt with interest. BUT if you save first, you will secure your ability to stop acquiring new debt which is the biggest step toward true financial freedom you can make. 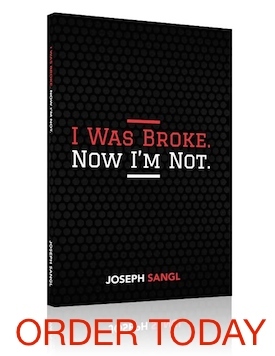 Learn the three things you should always save for in my book, I Was Broke. Now I’m Not. You can pick up a copy HERE. A question came up in our group study the other night about saving. The question was, after you’ve saved your $1000 or $2500, should you stop saving while you’re paying off debt? Shouldn’t you save a little, say $10/month while attacking the debt? Also, what about after the debt is paid off and you’ve got the 3-6 months fully funded emergency fund. Shouldn’t you continue to save? (I feel convicted by the parable of the man who was trying to build bigger barns). You need to work the steps!! Step 1 $2500 in the bank. Step 6- Pay off your house! Sept 7- Go crazy! Give, Save and have fun! !